Three of us, Bruce McRae, Marti Walker, and Helen Read, studied horn with the other, Bill Karstens. Bill studied horn with James Chambers at the Juilliard School of Music, and played professionally in New York and Montreal before moving to Vermont. James Chambers (1920 - 1989) studied horn with Anton Horner at the Curtis Institute of Music. 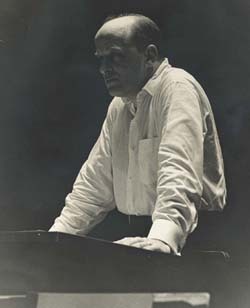 Chambers was principal horn of the New York Philharmonic from 1946 - 1969, and taught horn at Juilliard for many years. Anton Horner (1877 - 1971) studied horn with Friedrich Gumpert at the Royal Conservatory in Leipzig, Germany. In 1894 Horner moved to the United States, where he became principal horn in the Philadelphia Orchestra and taught horn at the Curtis Institute. 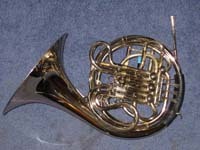 Horner was an early adopter of the newly invented double horn, patented in 1897 by the German horn makers Fritz and Walter Kruspe. Horner was playing a Kruspe Gumpert model double (designed by Edmund Gumpert, Friedrich's nephew) as early as 1899, and his own Kruspe Horner Model, upon which the Conn 8D is based, was introduced a few years later. Generations of beginning horn players have started out on Horner's etude book, Primary Studies for French Horn, which is still in print. Friedrich Gumpert (1841 - 1906) was born in Lichtenau, Germany, and learned horn from a town musician in Jena, Germany. Gumpert became principal horn in the Leipzig Gewandhaus Orchestra and horn professor at the Leipzig Conservatory. Three of his students, Anton Horner (1877 - 1971), Max Hess (1878 - 1975), and Max Pottag (1876 - 1970) went on to have a profound impact on the development of horn playing in the United States. Gumpert published 12 volumes of orchestral excerpts that are still available today, and the Frehse - Gumpert edition of the Kopprasch Sixty Selected Studies is among the most widely used method books for horn. 5. Gumpert or Gumbert? by John Ericson, Horn Articles Online.